++++ Message Begins: Greetings Librarian. After receiving your last message about rumours regarding Guard regiments summoning Demons to aid them in battle I was, at first, sceptical. In fact if it were anyone other than yourself (or any other member of your chapter) making these allegations then I would have them under investigation for fear they had gone insane, or worse, become tainted themselves. However I pursued these rumours and found, to my shock, that there is some truth to them. 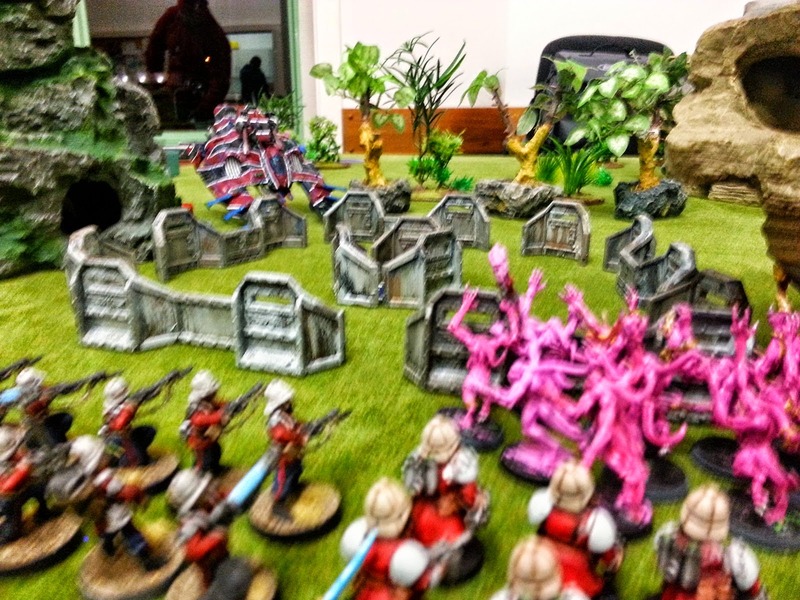 I have attached Pict Images of a battle between the insidious Eldar and the Pretorian 3rd Fusiliers, where it appears the Fusiliers’s Psykers summon Demons to aid them in battle (These images are strictly for your eyes and your chapters eyes only, no one outside our organizations may know of their existence). I advise you make haste to Pretorian 3rd Fusiliers last known position and purge them. After conversing with Inquisitor Malenciha on the subject of the heretical Pretorian 3rd Fusiliers it was decided that the best course of action was for me to take my Strike Forces and engage the Demon Worshipers. We made good speed to the unnamed planet where the heretics had gone to ground, we were alerted to this hideout by a member of the Officio Assassinorum who had been working with Inquisitor Malenciha. After making planet fall we located their hideout with great ease for they gave no care to hiding themselves, believing themselves safe. After sending in the Officio Assassinorum operative and servo skulls to recon the campsite i deployed myself, my Terminator squad and Strikes squads to the field, the Officio Assassinorum operative set himself up where he had the greatest view of the battlefield. I kept the purgation squad in reserve in case we required the firepower in a more advantageous position later in the battle. Then the enemy emerged, the appeared like ghosts emerging from the woodland like mist. They had not been in the camp, like we had expected, but instead had been waiting for us, although the question remains why the didn't ambush upon our arrival. the only answer i can is that those who follow chaos seldom act in a logical or rational fashion. Instantly i saw an opening that the Purgation squad could fill. With a word had the squad Deep Strike onto the field, they arrived with perfect accuracy and instantly opened up on a nearby mob of Heretics, and though they hadn't had time to prepare their mighty Psycannons they still reaped a fearsome toll thought the Heretics held their ground. The Purgation Squad arrives, this image was taken after they had fired their weapons. While my brothers purged the Heretics i was preparing the rest of my force for the fight to come. With ease i manipulated the currents of he warp to bolster my brothers and as one they opened up on one of the Heretics who had occupied the nearby bastion and destroyed him. The Bastion is purged of the Heretic. Then they advanced. First their Calvary rounded on the Purgation Squad and slew 4 of them with las Pistols alone! Surely some Demonic aim guided their shots. The rest of their line advanced and then reality splint in two and Demonic filth poured through, proving beyond a doubt that these scum were Heretics. After that battle was truly joined. The foul Heretic Cavalry charged the Strike Squad on our left flank and wiped them out, only for my Terminators and I to counter charged and wipe them out. I know not of how well the Assassin did but i do know he met a swift end at the hands of Heretic Leader and his men. Meanwhile the Heretic Psykers were constantly summoning more Demon filth to the field, and though the effort eventually claimed their lives, they did overwhelm my brothers and i myself was be set by a pack of Slanneshi She Demons. In the end my duty was to save as many lives of my Brothers as i could, seeing as the planet was uninhabited. I activated our emergency teleportation units and the surviving members of my Strike Force and myself were teleported to safety. We now return to Titan to rearm and re-enforce, the next time we met these scum it will end differently. So that was my first ever game of 7th edition 40k and i can say that, while i did enjoy it, screw the Psykic Phase, especially Demonology. The ability to summon troops for free and not have your opponent have a decent chance of stopping it (its still a 6+ to counter because the power isn't targeting your units). I simply didn't have a way to counter the Demons summoning and it cost me the game. Apart from the Psykic Phase i think that 7th ed 40k will be fun to play and i do plan on playing more of it with my Grey Knights, and all my Grey Knight battle reports will be narrative battle reports, so whats not to like. Until next time. Nice work mate. Ill give you a go without demons next time. It was fun, just that damm Psykic Phase. I look forward to our next encounter. Your knights look great on the field. Kelsey really liked them too. Good work on getting those done dude. Nice report, those GK and heretic guardsmen really looking good mate.